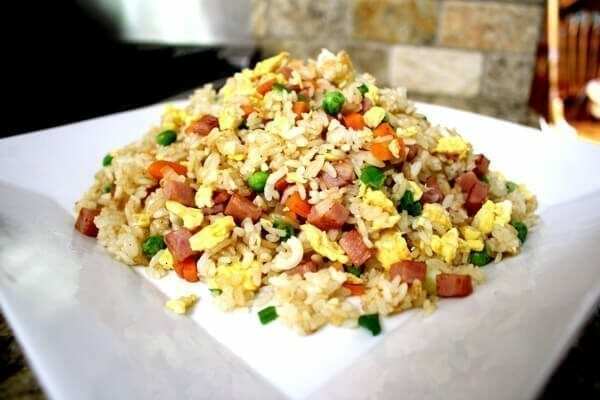 This Chinese banquet fried rice is our version of that last 10th course of a Chinese banquet that is served alongside the 9th course of long life noodles. Heat a splash of oil in your wok over medium high heat. Scramble your eggs and set aside. Add a bit more oil to the pan and cook your onions and carrots for about 2 minutes, or until slightly soft. Add your ham and stir-fry for an additional 2 minutes. Add peas and rice. Stir-fry to warm everything through. Season with salt, white pepper, and soy sauce. Stir in scallions. Continue to stir fry for another 3 minutes. Serve!